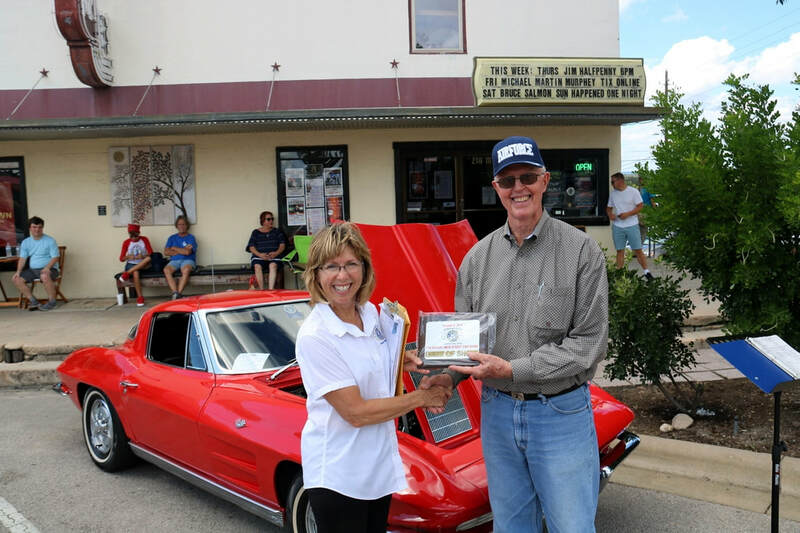 ​The 17th annual Main Street Marble Falls Car Show on October 6th, was another great opportunity for car collectors and car enthusiasts to get together. Main Street is blocked off and the cars are parked in front of all the retail shops and restaurants. It's a nice forum for owners to show off their cars and tell the interesting stories of where they came from. In spite of a pre-show forecast of rain, there was only a minor sprinkle and the day was mostly sunny. Main Street, from the library to 4th Street, was filled with a stunning assortment of vintage and modern cars, pick ups, and hot rods. This year's show included 94 participants, with more than half of them from the 1940s to 1960s. GM and Ford manufactured cars were more than half of the entrants, but there were several European cars including a '61 Bentley, a '48 Porsche, a '64 VW bus, and a '48 Thames. This year's judging for best-in-show was done by the participants themselves. Each were given a ballot and asked to choose their five favorites from all the cars on display. Jack Steward from Horseshoe Bay received the most votes and won the award for Best in Show. He is the original owner of a 1963 Corvette that he bought when he was in the US Air Force. This 55 year old car is in immaculate condition and still has the original spare tire. Above: Kiwanis Club secretary Kathy van Eeten presents Jack Steward with the plaque for Best In Show. 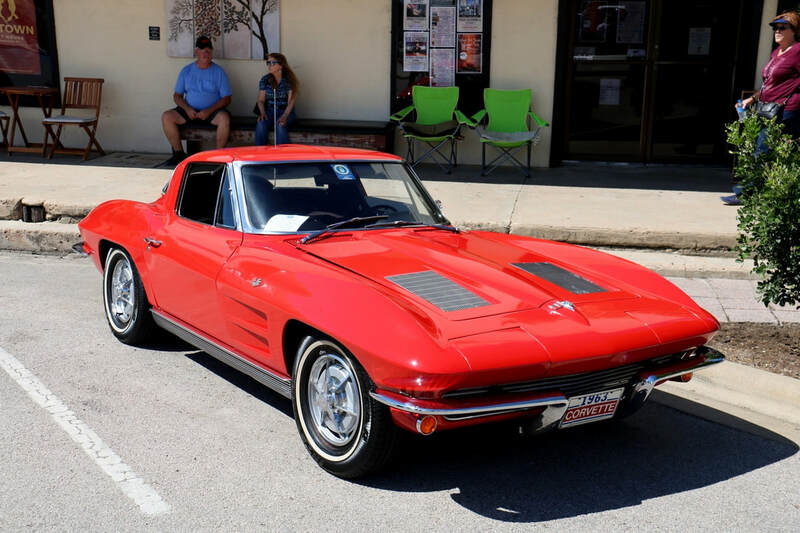 Jack's 1963 red corvette looks as new today as it did 55 years ago. What does Main Street look like when it's taken over by the car show? Check these photos and find out. In addition to all the cars, there were other things going on as well - a jazz band, music from our own DJ, and a car video, "The Packard Movie", at the Uptown Theater. The Kiwanis Club thanks the generous sponsors whose financial help made this show possible. 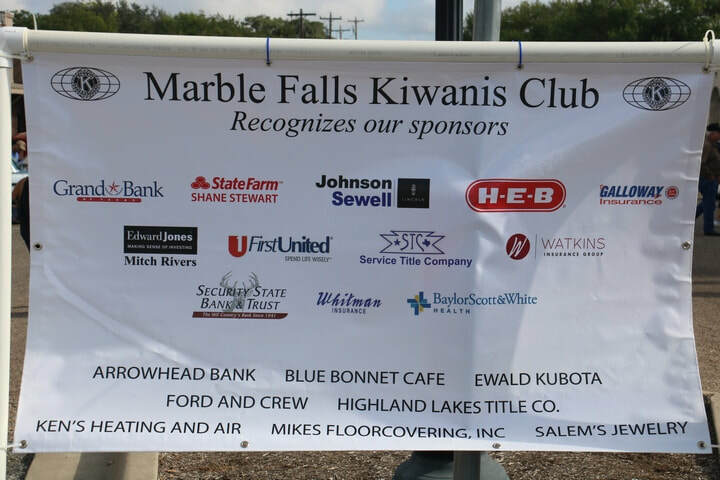 All proceeds go to programs that benefit the youth of the Highland Lakes area, especially programs by the Boys and Girls Club, and the Marble Falls Education Foundation. Marble Falls HS Key Club members Pedro, Roberto, Britani, and Jose also participated in the car show by helping with registration and by selling tickets for a 50-50 raffle.